This month's title photo comes from the Planet Connections Theatre Festivity production of Yvette Heyliger's White House Wives: Operation Lysistrata!, which has received nine Planet Connections Theatre Awards nominations including Outstanding Play With Music. The photo is by Yvette Heyliger. 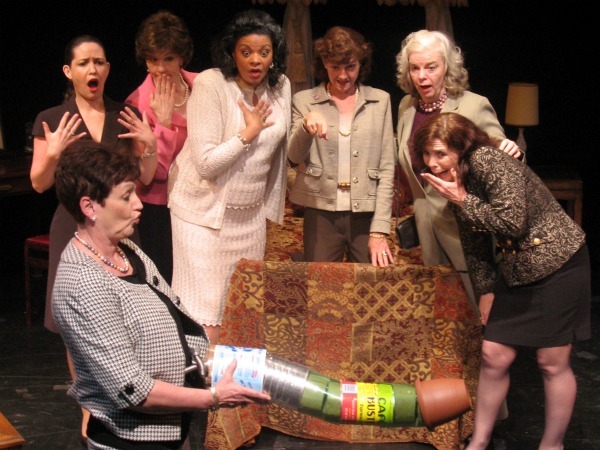 White House Wives: Operation Lysistrata! is an anti-war comedy inspired by Aristophanes' Lysistrata. This "what if..." play is set in the Lincoln Bedroom of the White House and stars the wives of the architects of the impending war in Iraq (Laura Bush, Lynne Cheney, Alma Powell, Cherie Blair and friends!). It takes place in 2002 before Congress votes on Authorization for Use of Military Force Against Iraq Resolution. White House: Operation Lysistrata! captures Aristophanes' strong anti-war message laced in the bawdy sexual humor so enjoyed by ancient, as well as present day audiences.